It’s an epicurean feast of gourmet Chinese cuisine at The Oriental Group of Restaurants through the month of August! 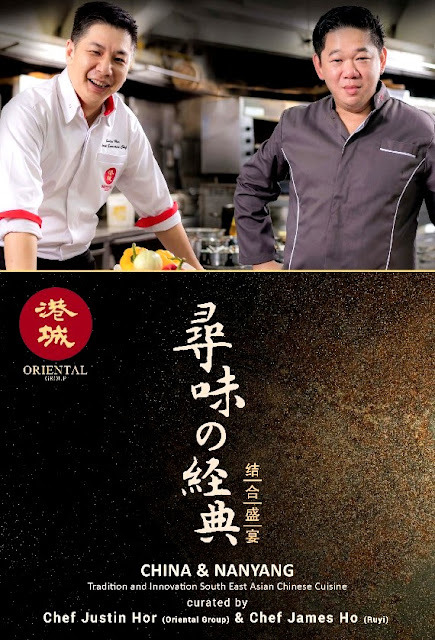 The acclaimed Oriental Group has been hosting its annual chef event with different themes together in collaboration with legendary “Old Master” chefs from Hong Kong and Shunde District in Guangdong with Group Executive Chef Justin Hor and the group’s in-house talent. The result has always been an exclusive soiree of authentic menus featuring various Chinese cuisines of 1960s yesteryears, Hong Kong cuisine, Teochew cuisine and more. Each year’s theme and menu as well as invited featuring chef exceeds its previous. 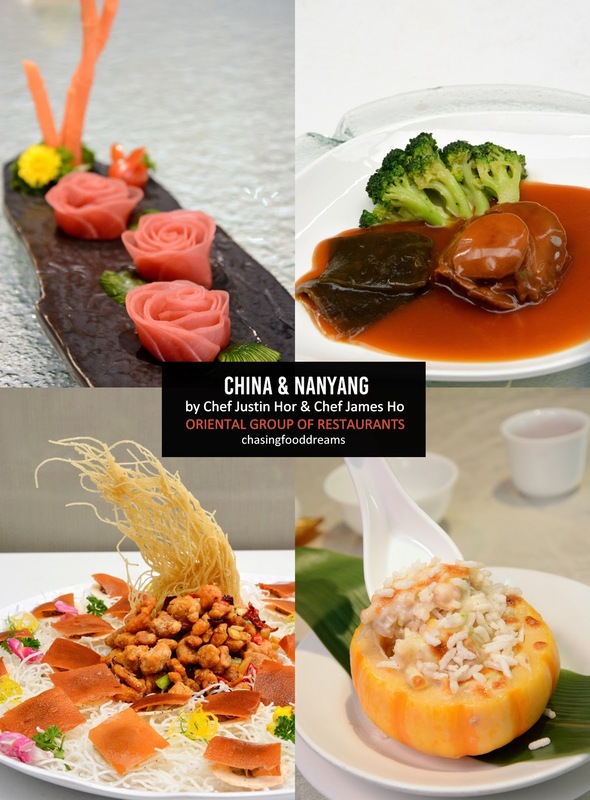 This year, two culinary maestro, Group Executive Chef Justin Hor of The Oriental Group and Corporate Executive Chef James Ho of Ruyi have gone all out with a China & Nanyang menu that highlights original Chinese cuisine flavours with the evolving flavours influenced by the Nanyang community. 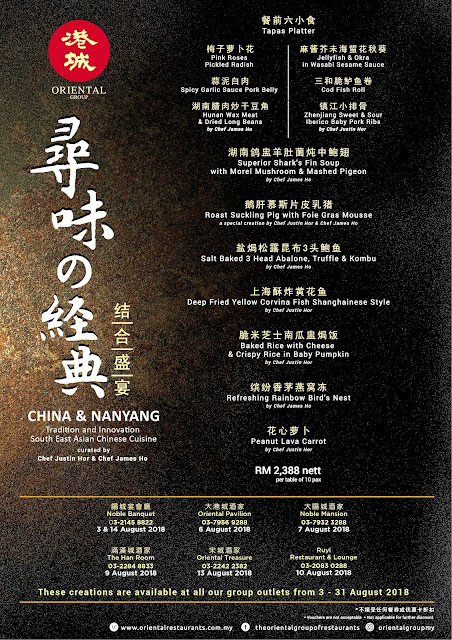 This specially curated China & Nanyang menu is available from 3 August to 31 August in all the participating restaurants of the Oriental Group. To tantalize the palate, a series of 6 Tapas Platters featuring Chinese appetizers from both chefs kick off, each one commemorating classic Chinese dishes of yesteryears injected with the chefs’ personal touches. Time and quality ingredients are the main essence to a good soup. Chef Justin’s Superior Shark’s Fin Soup with Morel Mushroom is a luxurious bowl of slow and long hours of double-boiled meaty bones along with dried seafood broth. Each sip of the broth sent warm fuzzy comfort to the tummy as well as a sense of luxurious satisfaction. There is an option to enjoy the soup with fish maw instead of the fins. Chef James culinary sorcery creation was an unusual pairing of Roast Suckling Pig with Foie Gras Mousse. Who else would thought to pair both East meets West ingredient of crispy suckling pig with unctuous and rich foie gras? The amazing duo worked out to be superb in flavours and textures. The richness of the suckling pig and foie gras was cleverly balanced up with its centerpiece of crispy and spicy Szechuan laced chicken to pump up some heat on the palate. A fiery volcano of salt stole the limelight as we catch a hot flaming scene before savoring the Salt Baked 3 Head Abalone, Truffle & Kombu. Chinese cuisine has always been able to turn the hardest ingredient into one of the most sumptuous dish on the table. Braised for 10 hours, the abalone and the luscious abalone sauce tasted as stunning as it looks. Flavoured with umami seaweed and perfumed with heady truffles, the abalone us in awe of its beautiful flavours. The sauce shared equal limelight with the abalone and was practically scraped off the plate by many of us that day. The next dish of Deep Fried Yellow Corvina Shanghainese Style, by Chef Justin, was well-thought off since the last few courses has been lusciously rich in flavours. Classically simple, the crispy golden fried Corvina was deliciously delicate and has a natural briny sweetness. Marinated minty sour plum cherry tomatoes accompanied the fish as a palate cleanser. The Yin and Yang textures of rice is cleverly highlighted in Baked Rice with Cheese & Crispy Rice in Baby Pumpkin. Presentation was utterly adorable and elevated this cheesy duo of fluffy fried rice with crispy puffed rice well. To end the China & Nanyang feast, a grand finale of misty smoke surrounded the Refreshing Rainbow Bird’s Nest and Peanut Lava Carrot. Meticulous effort of hand-shaped fried carrot mochi with a creamy nutty peanut filling followed by premium bird’s nest in chilled sweet broth with fresh fruits, white fungus and mint certainly made a lasting impression of this year’s special menu by The Oriental Group. The dishes in this collaboration will be available for a limited period from 3 till 31 August 2018 at all participating outlets under the Oriental Group of Restaurants and Ruyi. 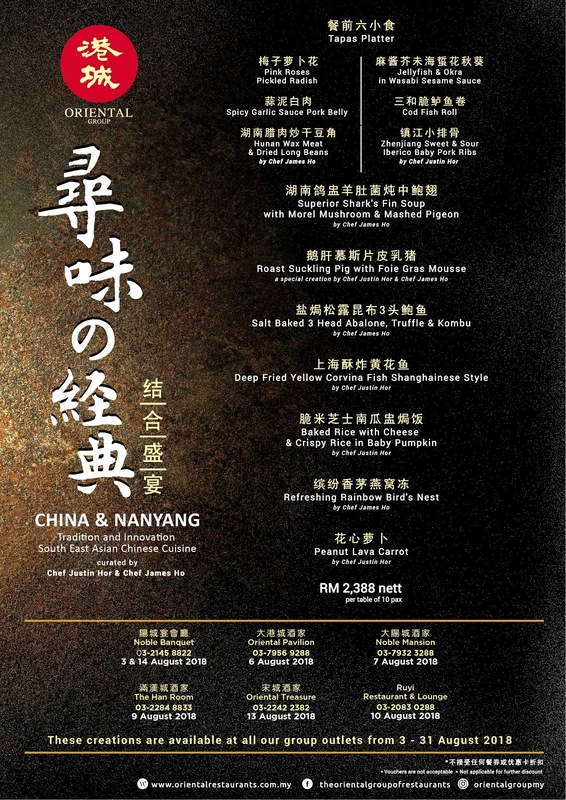 The set menu is priced at RM2,388 nett per table of 10 pax. A la carte is available as well. Suckling pig's calling my name! I like this place. I was here the other night, I've been there for about four or five hours and found the prices reasonable on all fronts and the staff to be so friendly. I would be the perfect person to have on an infomercial for these home studios NYC if they ever had one.